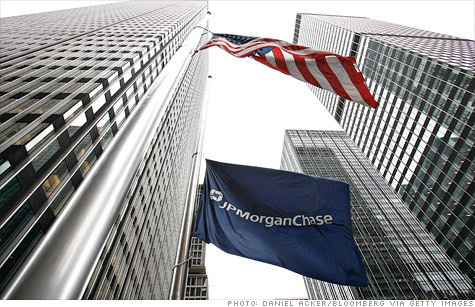 JPMorgan Chase last week disclosed a surprise $2 billion loss from unsuccessful trades. NEW YORK (CNNMoney) -- Wall Street's risk appetite is back, and the bets are as big as ever. JPMorgan's announcement last week of an expected $2 billion loss from the bank's trading activities offers a painful lesson: It's hard to limit and define what kind of trades might mitigate risks for a bank with roughly $2.3 trillion in assets. "If this type of problem can happen at JPMorgan Chase, (JPM, Fortune 500) which has better risk management, it can happen over time at others with weaker infrastructures, such as Citigroup (C, Fortune 500) and Bank of America (BAC, Fortune 500)," said Mike Mayo, a bank analyst at Credit Agricole Securities. In the past two years, most major banks have shut down their proprietary trading desks, which had let them make massive speculative bets on everything from market direction to housing. Banks took that proactive step in anticipation of the Volcker Rule, set to go into effect this July, which restricts banks from operating them. JPMorgan's CEO, Jamie Dimon, has been one of the rule's most strident critics. But JPMorgan's big bad bet, which was supposed to act as a protection against risk, would not be considered a violation of the Volcker Rule. "What do you call a hedge and what do you call a bet? There are many situations when there's a very gray area between the two," said Andrew Lo, a professor of finance at the Massachusetts Institute of Technology. For JPMorgan, the losing trade was carried out by its chief investment office in London that was essentially tasked with keeping JPMorgan from losing big under any adverse conditions. In recent years, Dimon had built up this central risk office and brought in players from proprietary trading desks and hedge funds, and given the unit large pools of money to work with. JPMorgan's bad trades used the same instrument that caused the downfall of AIG (AIG, Fortune 500): credit default swaps -- essentially insurance contracts that investors use to insure against, or profit from, a default. For most of this year, JPMorgan's traders had been placing large bets on an index comprising a basket of investment grade companies, according to several market participants. Many of these bets were complex and highly leveraged. "We're a big bank [and] the securities portfolio had an unrealized gain of $8 billion," Dimon told David Gregory Sunday on NBC's "Meet the Press." "In hindsight, we took far too much risk. The strategy we had was barely vetted. It was barely monitored. It should never have happened," he added. As hedge funds and other trading desks took notice of the bank's bets, they essentially ganged up on JPMorgan by taking opposing positions. "People started becoming more aware that someone had one big position, and it was going deeply underwater. It was like sharks seeing blood," said a source in the trading unit of a competing firm. JPMorgan's trader, dubbed the "London whale," found it difficult to unwind his outsize positions, leading to last week's disclosure. "Hedging should make your bank less risky. In this particular case, we made a terrible mistake," Dimon said Sunday. "You're not going to make banks risk-free, but we agree with the standards that make it safer." This isn't the first time in recent years that JPMorgan has taken big bold bets. "For some time, JPMorgan has been taking huge positions in commodities, currencies and credit derivatives," said Janet Tavakoli, president of Tavakoli Structured Finance, who formerly worked for JPMorgan's Dimon at Bank One. "It looks to me this was being run as a prop desk, not to hedge the firm's overall risk." Sadly, details about just how big these bets are at any bank remain sparse. "Derivatives don't appear on balance sheets," said Lo. "There's an unfortunate complexity in these securities, and there's an inability of the accounting framework to show them." Dimon addressed the question of just how much he knew last month when he called news reports saying these bets had gone awry a "tempest in a teapot." "First of all, I was dead wrong when I said that," Dimon said during his "Meet the Press" interview. "I obviously didn't know or I never would have said that." "We got very defensive, and people started justifying everything we did. The mistake had been brewing for a while," he added, while also acknowledging that it's right for regulators to be investigating, which they reportedly are, both in the United States and the United Kingdom. JPMorgan declined to comment further. As the markets await more details about what happened, analysts and traders agree on one thing. This may appear to be an anomaly right now, but there are more billion dollar fumbles to come. "We've seen it before and we'll see it again," said Mayo.